Taking Route 519 south from Alpha through Springtown, the narrow macadam curves west as it enters the lower Musconetcong Valley and joins Route 627. This, 627, is the route to stay with for 519 soon deserts us and goes off to Milford. Route 627 hugs the lower Musconetcong River for its last few miles of existence through a little-known collection of ancient settlements and beautiful farms. 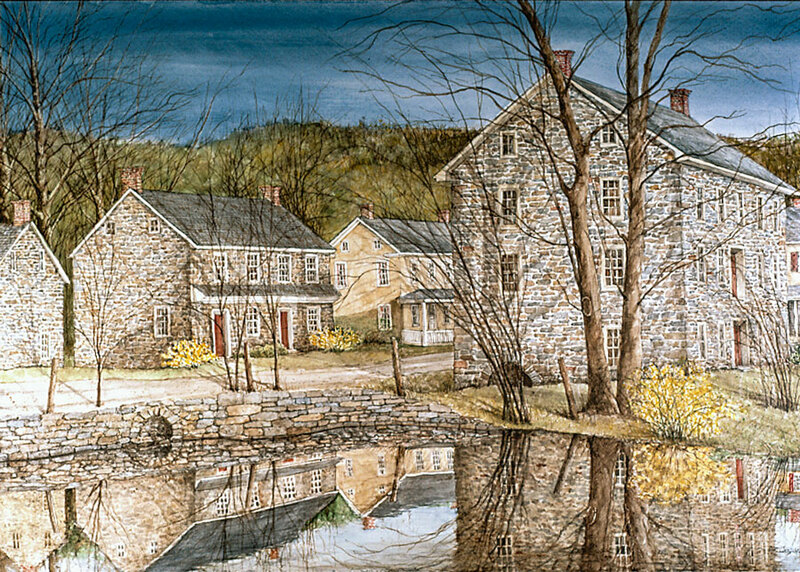 As a lover and painter of old mills, Dan Campanelli was encouraged to seek out this mill in Finesville for painting by the woman who now owns and has started restoration of it. The river is squeezed into a gorge in an area known today as Warren Glen, and the water leaves this gorge like a shot from a cannon. Colonial engineers, by some esoteric formula, measured water volume, drop, and velocity, and determined that the last few miles of the river, before it joined the Delaware, produced an amazing 1300 horsepower--a lot of horses in those days. Canny farmers were quick to harness this resource; dams and mill races were built all along the last few miles of the river's length. In the mid-1700s a water-powered forge was built just below the gorge. Iron ore called hematite was mined close by, wood for charcoal was in abundance as was limestone used in extracting the metal, and the water supply never failed. 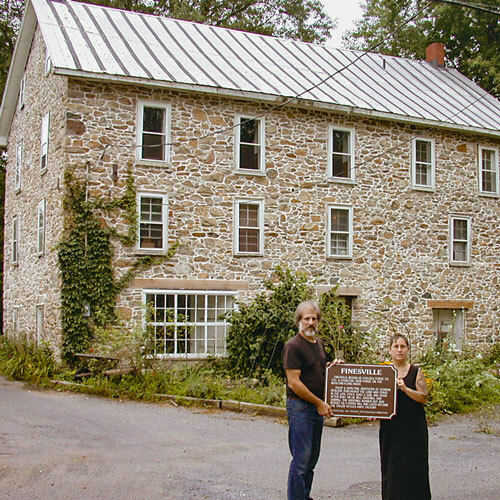 Dan and his wife Marty stand in front of the mill holding one of the signs that explain the history of this and other sites in the Musconetcong River valley. For generations the area was known simply as "The Forge". Barely down river from the forge a family named Hughes built another power dam and called this settlement, in all modesty, Hughesville. It would become a prisoner-of-war camp for British captives during the Revolution. Hughesville along modern Route 627 consists of a paper mill today and a collection of old-fashioned company houses, grouped together on the Hunterdon side of the river. A mile below Hughesville, past the Alba Vinyard on Route 627--visitors welcome-- is a collection of homes and other buildings known as Seigletown. The Seigles were German immigrants who established a pottery business here. The product was known as Seigleware and enjoyed a great popularity in its day. Just past Seigletown another forge called Chelsea Forge was built. A settlement here was established by the Fein family--locals always misspelled it "Fine"--and the prosperous town of Finesville was born. Members of this family built a grist mill, a saw mill, and an oil mill producing oil from flax seeds (called linseed oil). The village, today, is a collection of old stone homes that straddles the river, the hoary grist mill on the Warren bank. At the mouth of the river, where it joins the Delaware, a man by the name of Hunt built a saw mill and grist mill. Before 1800 three brothers named Shank operated a ferry here across the Delaware. The forges were built just in time. When the Revolutionary War commenced, Washington relied on them for cannon balls. Wartime production flourished until the area began to run out of trees for charcoal. The trees became more valuable than the ore, and some locals were not averse to stealing one, now and then; a new crime was invented called "tree poaching". The accelerated production for the war effort also used up much of the available ore and the coming of peace saw a decline in production at these forges. The iron works at The Forge limped along for several years, producing pots and pans and other mundane objects for sale to the general populace, but the days of glory had passed. The same thing happened to the Chelsea Forge downriver at Finesville. 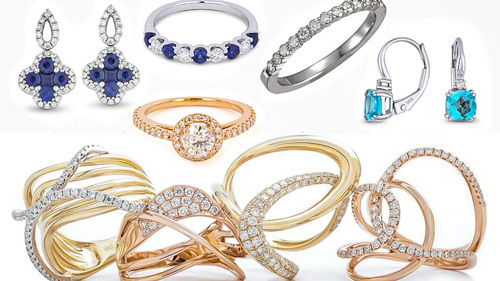 In the middle of the last century an entrepreneur by the name of John L. Riegel appeared on the scene. Riegel was interested in the manufacture of paper. 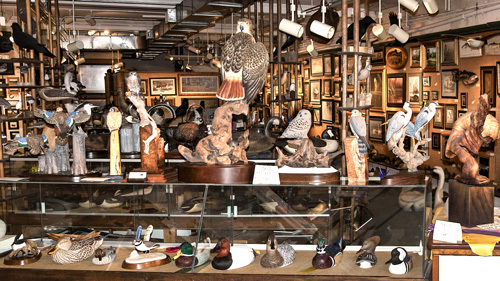 A paper-producing plant here would be easily accessible to the two biggest markets in the nation, New York and Philadelphia; and the valley possessed an almost unlimited supply of pulpwood and water, both essential to the manufacture of paper. 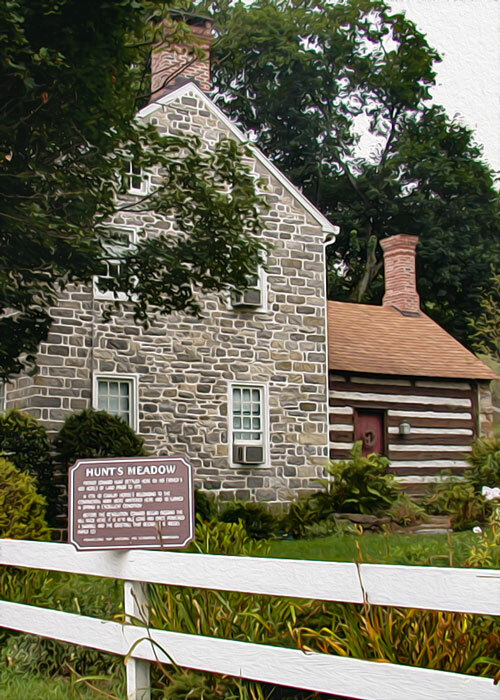 Hunts Meadow: "Patriot Edward Hunt settled here on his father's 600 acres of land prior to 1772. In 1778, 60 cavalry horses belonging to the Continental Army were wintered here and 'returned in spring in excellent condition.' Before the Revolution, Edward began digging the mill race here. It is 8/10 mile long and once powered a sawmill and the gristmill that became the Riegel Paper Co."
Riegel's first plant was at the Finesville mill, but this structure, the former grist mill, was quickly outgrown. The second location was on the nearby Delaware at the site of Hunt's grist mill. Riegel established a paper mill here at a hamlet that is known today as Riegelsville. A bridge, replacing Shank's Ferry, crosses the river here into Pennsylvania to another village called Riegelsville, named for a son of John L.. 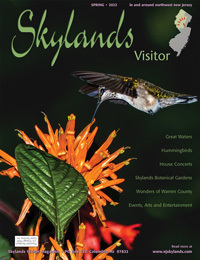 The Pennsylvania town is larger than its namesake in Jersey and has several fine restaurants for the modern traveler. A hundred years ago this thriving Riegelsville was a stop on the Philadelphia-Easton trolley line; Route 611 here is still the quickest way to get to New Hope, downriver. On the Jersey side, River Road takes its sweet time threading its way between an abrupt embankment and the old Bel-Del line along the river before it finally arrives in Milford where it links up with more modern thoroughfares. The paper business was so good that Riegel and some associates, in 1873, formed the Warren Manufacturing Company and located the main plant at the site of The Forge, upriver. A new dam was built with a one-mile millrace which operated two large water wheels. Riegel built a smaller plant at nearby Hughesville. The Lehigh Valley Railroad ran a spur to these locations. The company built a village for its employees, a collection of commodius homes across the street from the plants. Each house was two-storey, with a full-width front porch. Shrubs and trees were planted around the homes and a paved sidewalk was constructed along the dirt road. The little one-room school at Hughesville was quickly outgrown and a new two-room structure was built across he street from the plant, at the site of the present school. Churches,stores and a fine hotel completed the village, the largest in the lower Musconetcong Valley. The factory town was called Warren Paper Mill at first but, later, the name was changed to Warren Glen, more descriptive of this hamlet on the banks of the Musconetcong. 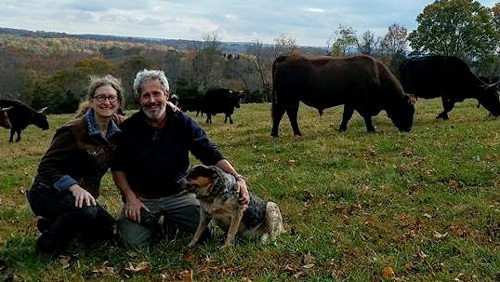 The mills, perched discreetly on the Hunterdon bank, still depend on the river to operate, but have a new owner called FiberMark, Inc. The company town is nearly gone--with the coming of the automobile people didn't have to live where they worked. The valley remains much as it was almost 300 years ago, its small settlements clustered along the sparkling stream; its cultivated fields stretching up the gentle slopes on both sides of the river. And the river itself, whose power has brought centuries of life and prosperity to the valley's inhabitants still rushes down to the Delaware and Roebling's bridge. 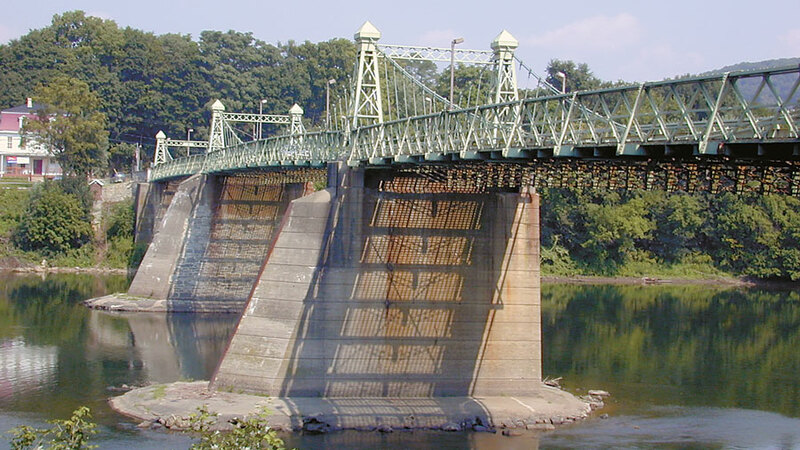 The bridge over the Delaware at Riegelsville was built in 1904 to replace an older, covered bridge, swept away in the ferocious "Pumpkin Flood" of October, 1903. This new structure was built by the John A. Roebling Company, founded many years earlier by the man who built the durable Brooklyn Bridge. The Riegelsville Bridge survived the river's worst flood, the one spawned by Hurricane Diane in August of 1955.